How Many Calories Are for Breakfast, Lunch and Dinner? The vitamin C baked potato chips helps your body produce collagen. 2 How Many Calories Are in Pita Chips? 3 Can I Exercise on the Master Cleanse Diet? 4 How Many Calories in a Baked Potato With Cottage Cheese? The average potato chip is fried in oil, but for a healthier option, look for baked varieties. This lighter choice imparts the same taste and crunch of traditional chips, but without the fat and greasy hands. You can make baked potato chips at home, making it easy to control the amount of salt or add other flavorings. 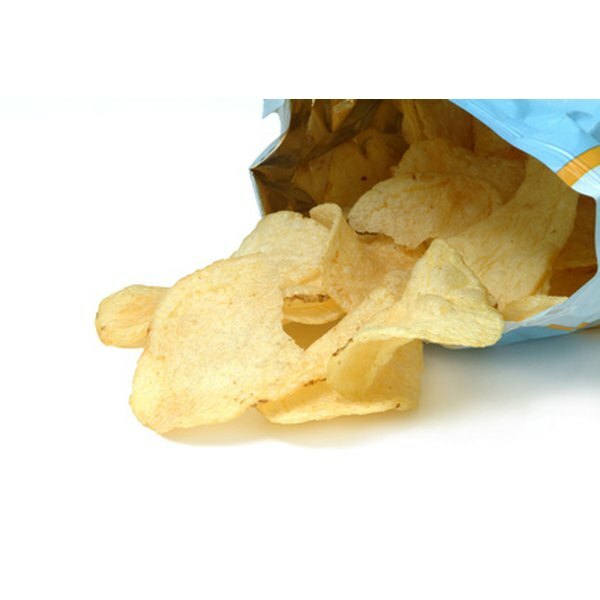 The Lay's brand of baked potato chips has 120 calories per 1-oz. serving. This amount works well as a snack -- The Diet Channel advises eating snacks that contain 100 to 200 calories to lessen hunger pangs, which helps prevent overeating at your next meal. Eating a serving of these chips adds 2 g of fat to your meal plan compared to the 7 g of fat in a serving of regular potato chips. An ideal intake of fat ranges from 20 to 35 percent of the calories in your diet. A serving of baked potato chips has 23 g of carbohydrates, or 7 to 10 percent of the carbs you should consume each day for energy and to keep your central nervous system functioning. A type of carbohydrate not used for these purposes is fiber, and you’ll take in 2 g of this nutrient in each portion of chips. The fiber in baked chips helps prevent diarrhea and constipation when consumed in adequate levels for your body; your meal plan should include 25 to 38 g per day, although drinking enough water is critically important when consuming fiber. You also get 2 g of protein in each serving of baked potato chips, but you’ll need quite a bit more to reach your nutritional needs -- generally 46 to 56 g daily. Eating baked potato chips gives you a small boost in the vitamin C you need every day to keep your immune system running smoothly; a serving of this snack contains 4 percent of daily recommended intake of this vitamin. You also take in 2 percent of the calcium you need each day. The calcium in these chips bolsters bones strength and may help ward off high blood pressure. Too-high salt intake contributes to high blood pressure and heart disease, so carefully monitor the salt in your diet, aiming for an intake of no more than 2,300 mg if you are healthy or 1,500 mg if you have hypertension or heart problems. 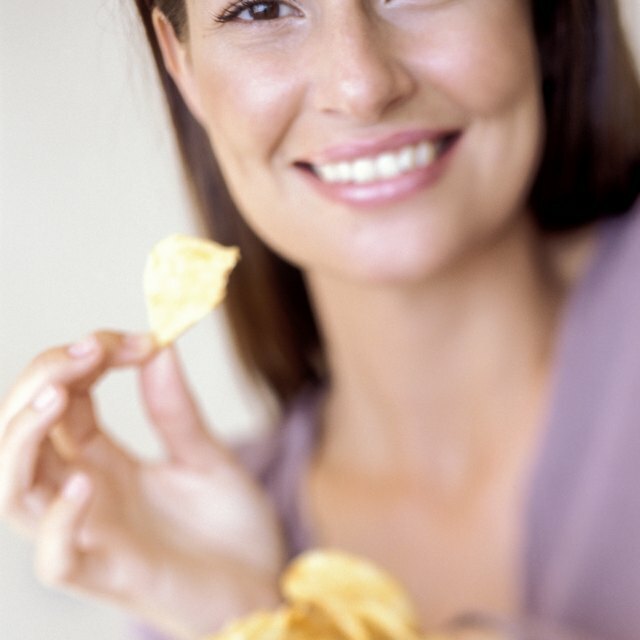 While the 180 mg of sodium per serving of chips may not seem like much, if you eat more than 1 oz. of baked potato chips, this amount can add up quickly. If you make this snack at home, consider using salt substitutes to cut down on the amount of sodium.